Global stock markets endured heavy selling on Thursday as investors were spooked by the spectre of a default by Dubai and after a febrile foreign exchange market saw the yen surge to a 14-year high against the dollar. The turmoil caused a flight to less risky assets. Gold, which had challenged $1,200 in Asian trading, fell back from its highs and money flowed into havens such as German government bonds. US markets are closed for the Thanksgiving holiday, but electronic trading of the benchmark S&P 500 equity futures contract showed a potential drop on Wall Street of 2.2 per cent. As the European trading day progressed it became clear it was Dubai World’s difficulties that had hit a particular nerve, reminding investors of the lingering damage wrought by the financial crisis. Banking stocks tumbled on concern about their potential exposure to Dubai. Indeed, the cost of insuring against default by the emirate jumped, with Reuters reporting the Dubai five-year credit default swap being quoted as high as 500-550 basis points. This means it would cost about $500,000 a year to insure $10m of Dubai’s debt. On Tuesday it would have cost about $360,000. Greek and Irish government five-year credit default swaps also moved higher as nations with supposedly precarious fiscal positions were punished. In contrast, investors sought out comparative haven assets, pushing the yield on the German Bund down by 8 basis points to 3.16 per cent. Dubai shook investor confidence across the Persian Gulf after its proposal to delay debt payments risked triggering the biggest sovereign default since Argentina in 2001. The cost of protecting government notes from Abu Dhabi to Bahrain rose, extending the steepest increase since February as Dubai World, with $59 billion of liabilities, sought a “standstill” agreement from creditors. Unlike Argentina, which stopped payments on $95 billion of debt eight years ago after yields on benchmark bonds more than doubled in four months to more than 40 percent, Dubai’s announcement yesterday “was a surprise,” said Alia Moubayed, a London-based economist at Barclays Plc. While some were spouting US government debt default theories or dollar devaluation theories others were looking for the "unwatched pot". Inquiring minds are taking another look at Gold And The Watched Pot Theory written October 07, 2009. The reason for the strength in gold is not US inflation. As I have pointed out many times, gold fell from 850 to 250 over the course of 20 years, with inflation every step of the way. Thus, the inflation story just does not fit. However, it should be clear that a major financial crisis is in store following a long period of competitive currency devaluation and massive debt and derivatives expansion by nearly every major country on the planet. There is seldom a mention of the problems in European banks who foolishly lent money to the Baltic States in Euros or Swiss Francs and now those Baltic country currencies have collapsed and the loans cannot be paid back. European banks also lent to Latin America and those loans are also suspect. Arguably, European banks are in worse shape than US banks, but no one talks about it, at least in the US. Spain has unemployment approaching 20% yet must suffer through the same interest rate policy as Germany. Seldom does one hear about this either. Certainly the UK is a complete basket case with its banks on government life support. Iceland has already blown up, who is next? Most are not aware of the problems in China, Japan, or Europe. However, the problems in the US are universally well understood. Indeed all eyes are on the dollar and everyone is talking about deficits, monetary printing, and especially unfunded liabilities even though the latter is tomorrow's problem, not today's. A watched pot may boil, but it's not likely to explode, especially when everyone watching the pot expects an explosion any second. Indeed, it would be fitting if the Ridiculous Hype Over Secret Oil Meetings, helped form a bottom on the US dollar. Yet, it's easy to see that a financial crisis is brewing. Somewhere, something is going to blow sky high, but from where I sit, it's as likely to be in the Yen, the Swiss Franc, the British Pound, or something no one is watching at all as opposed to the US dollar specifically. Amazingly some see this as hyperinflationary. The DEFLATIONISTS ARE DEAD WRONG ! The last 8 months have proven it to be so ! But STILL they cling on as though they have blinkered visions as a function of presumably not having to put their own money on their deflation calls. What will there position be in another 8 months - it will be to REINVENT HISTORY TO IMPLY THEY SAW IT COMING ALL ALONG! What's amazing is how hyperinflationists who have blown the call for 10 years running now accuse deflationists in advance of rewriting history. Here's the deal. Deflation happened, the only debate is how long it lasts. It is more than premature to proclaim the end of it on the basis of an 8 month period. Things do not progress in a straight line and a rebound after a 51% plunge in the S&P 500 and 10 year treasury yields close to 2% was expected. That rebound is a much proof of the end of deflation as any of half a dozen 50-100% rebounds in the Nikkei over the last two decades, or the massive rebound in the DOW in 1931 before it plunged to new lows. Many of those pointing to 8 month timelines as if that is what matters ignore an even bigger timeline in which stocks fell that 51%. If this rally is proof of inflation the the plunge must be proof of deflation. The reality is neither is true. What is true is that in a credit based fiat economy, what matters is ability of the Fed and Central Banks in general to foster bank lending. And that is not happening. Allowances for loan losses will decrease as charge offs increase. 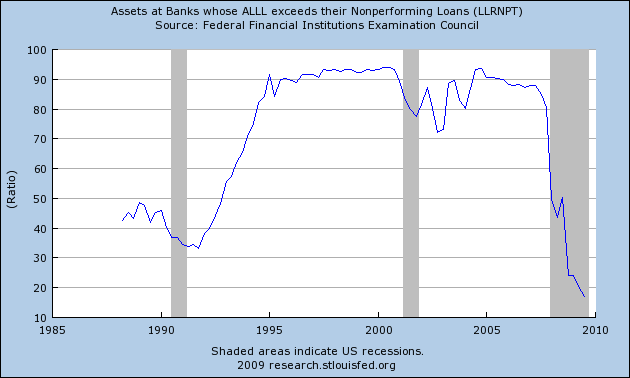 However, the above charts are in relation to non-performing loans. Because allowances for loan losses are a direct hit to earnings, and because allowances are at ridiculously low levels, bank earnings have been wildly over-stated. The $trillions poured into the economy got a measly 2.8% rise in GDP. Now what? 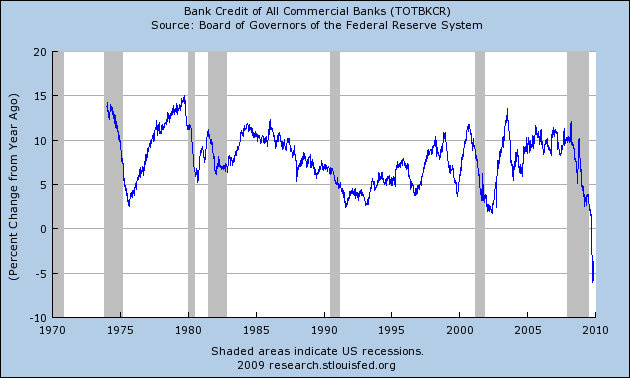 Jobs are still contracting, businesses are not borrowing, banks are reducing credit card limits, etc, etc. Those are not conditions of inflation, let alone hyperinflation. Now concerns are rising in Congress and the administration over the national debt. Meanwhile, more defaults loom: on housing, on commercial real estate, and on credit cards. Two year treasury yields are at a record lows of .74 and five year treasuries are at 2.11. If hyperinflation is coming, buy houses. Nowhere else can you get the leverage you can get in houses. It's a sure thing. Meanwhile I suggest gold has been rising for another reason: credit stress and fears of deflationary economic collapse. Dubai just stepped up to the plate out of the blue, defaulting on debt. Defaults are part of the deflationary process. Prepare for more of them because they are coming. I see no reason to change my stance that the US is in for a long slug of hopping in and out of deflation for quite some time. Ironically it is the hyperinflationsts who are rewriting history. The hyperinflationists had it wrong, deflation happened first. Deflation is here, the only debate is how long it lasts. Some of us saw it coming, the rest still scream about the massive inflation that is supposedly coming. They may be correct eventually, but when? 26 Nov 09, 22:13 a Deflationist Lashing Out Nouveau Inflationists? I have a great deal of respect for Mike so I will just make one single point, and that is my inflationary outlook is a NEW conclusion born out of current analysis that I am only now during November in the process of writing up as first a series of articles, which given the depth of evidence and complexity of trend projections the whole scenario will have to resolve into an ebook (that I will make available for free this year). Crude Oil is well into a parabolic up move that has been driven higher by inflation hedging which had fed upon itself, the potential exists for a near imminent cascading mainstream interpretation of future economic conditions to suggest lower future inflation which would lead to a fast paced decline in oil prices targeting a move back towards the September 2007 breakout point of $80. With stop-gaps along the way of $135, $110, $100 and $85. Therefore I continue to remain bearish on the prospects for crude oil during the next 3 to 6 months or so barring a BLACK SWAN event. In Summary, I do not know at precisely what price level the Dow will make a low during 2009, my best estimate at this time is 6,600, but I am expecting that it will mark the start of a multi-year bull market that will eventually make 2008-2009's price action appear as a mere minor blip, much as the 1987 crash appears on today's price charts. Feb 2009 - UK Recession Watch- Britain's Great Depression? Sep 2009 - UK Inflation Forecast, Will RPI Deflation Return to Inflation? The trend into Extreme UK Deflation as measured by RPI has come to an end, forward inflation is expected to rise at a subdued rate as result of the economic recovery into the 2010 general election with RPI targeting +1% so Yes RPI Deflation will come to an end, but thereafter the high risk of a double dip recession expectation suggests the shallow uptrend in inflation will come to a halt during 2010 despite further quantitative easing and arm twisting of the banks to LEND into 2010 as the Bank of England attempts to increase the velocity of money by all means with even the option of negative interest rates to force the banks to take risks rather than park their tax payer bailout money at the BoE to earn risk free interest on. However as i warned in November 2008 Bankrupt Britain Trending Towards Hyper-Inflation?, that Britain could be put on to the path of hyper inflation if it proceeded to follow the mainstream academic economist suggestions of printing money to monetize debt in ever escalating amounts as a consequence of the deficit spending and bailing out of the bankrupt banks, which is the path that Britain has subsequently embarked upon during 2009. I suspect today's deflationists will eventually be forced into changing their views over the coming years in the face of the failure of expected trends to materialise, just as a 60% stocks rally occurred whilst some die hard deflationists focus remained fixated on the preceding 51% drop. For more on my NEW INFLATIONARY scenario, ensure your subscribed to my always free newsletter to get the full implications in your in box as it will be one of my seminal pieces much more so than even the Stocks Stealth Bull Market Scenario of March 09 and Crude Oil Top of July 08, or the UK Housing Market August 07 Top and Bear Market were before it amongst many others.